It comes with an IPX7 rating and a 5-hour playback time. Harman has launched a new waterproof Bluetooth speaker in India. Named the JBL GO 2, it boasts a 5-hour playback time on a single charge. It will be sold at a price of Rs 2,999. HARMAN International, a wholly-owned subsidiary of Samsung Electronics Co., Ltd. focused on connected technologies for automotive, consumer and enterprise markets, today announced the launch of JBL GO 2 in India. JBL GO 2 is a portable, compact Bluetooth speaker with next-generation audio quality and a new, bolder design. JBL GO 2 is the second generation Bluetooth speaker of JBL GO, considered as one of the most popular portable Bluetooth speakers in this category. The new JBL GO 2 is priced at INR 2,999 and is available at various retail stores and chains, and at 350 key Samsung brand stores across the country. “We are extremely delighted to introduce the all new JBL GO 2 - this ultra-portable, compact, palm-sized, brightly colored, waterproof speaker will impress music lovers with its richer and clearer audio output. JBL GO, the earlier version of GO 2, was an instant hit amongst Indian music lovers. Its portability and audio quality has made it to be the perfect companion for any music lover on-the-GO. 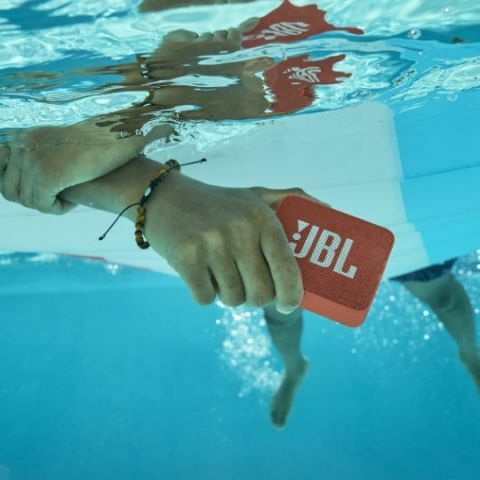 With the IPX7 technology, we want Indian JBL GO fans to upgrade to the new waterproof version JBL GO2 and enjoy the upcoming monsoons with rejuvenating music,” said Sumit Chauhan, Vice President - Lifestyle Audio, HARMAN India. JBL GO 2 comes in a thrilling combination of JBL Signature sound and waterproof IPX7 design coupled with increased audio quality and performance. Users can easily submerge it while playing, or carry it to the poolside, beach, the porch or patio. They can also wirelessly stream music via Bluetooth or with a wired connection from any smartphone or tablet. The built-in rechargeable Li-ion battery supports up to 5 hours of playtime. For consumers looking for more versatility in a portable speaker, the GO 2 also offers crystal-clear phone call experience with its built-in echo and noise cancelling speakerphone. Crafted in a modern, block shaped design with soft, curved edges; this speaker comes with 12 eye-catching colors options. Of-the-moment shades like Ash Gray, Icecube Cyan, Seafoam Mint, Lemonade Yellow, Sunkissed Cinnamon, Pearl Champagne, Midnight Black, Deep Sea Blue, Moss Green, Coral Orange, Ruby Red, Slate Navy give a pop of color to your sound and instantly raises your style profile to all-new levels.